With a cast of only two, most often in character as Macbeth and Lady Macbeth, Macbeth Muet plays with the traditional narrative of the tragedy, but keeps the guts, delirium, and death. Macbeth (played by Jérémie Francoeur) and Lady Macbeth (played by Clara Prévost) also grace the stage as Banquo, Banquo’s son, Macduff, Lady Macduff and the Three Witches. In place of speech, Macbeth Muet story-tells with an effective and versatile sound design. The shape-shifting medley of sound effects and music is wonderfully dramatic. It’s occasionally somber and spooky, often playful and cheeky, and gives an inventive voice to this mute performance. The comprehensive sound design guides the show and gives the narrative a structure that, without spoken words, is still easy to follow. Never have I ever seen a production of Macbeth wherein Banquo and his son bond to the smooth musings of Just the Two of Us — until now. The small-but-mighty cast maintained an excellent energy throughout the performance. They had natural chemistry — I really believed them to be man and wife, king and queen — and executed several tightly choreographed fight scenes with ease. The performance was highly physical, and though the cast didn’t speak, they certainly roared with their movements. They slammed and thrashed their bodies on stage, drumming their limbs as though they were cymbals. As an added bonus, the use of shadows gave their physicality an even greater life. On the whole, Macbeth Muet is a lively, liberated rendition of Shakespeare’s tragedy. 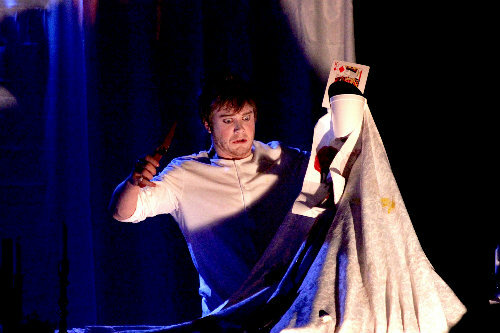 There’s charming, devilish puppetry, brutally cracked (or dare I say, murdered) eggs, and violent splashes of faux-blood. A performance that looks like it was equally fun (and tragically messy) to create, it was a joy to see played out on stage. This venue is barrier-free. The designated accessible seating is in the middle of the auditorium.